eMagin reported the company's financial results for Q3 0216. Revenues were $4.3 million, down 20% from Q3 2015, operating loss was $3.8 million (up from $3.3 million in Q3 2015) - and net loss was $2.4 million (up from $2.2 million in Q3 2015). As of the end of September the company had about $6.9 million in cash and equivalents (down from $9.3 million in the end of 2015). These are disappointing results, but eMagin says it is making considerable strategic business progress. On the technical side, eMagin is developing direct-patterning micro OLEDs, and expect to complete its development work under the Man Tech program in 2017. Military customers will be offered displays in the second half of 2017. The 2K x 2K full-color OLED microdisplay is also progressing is on schedule to produce engineering samples. Samples will be shipped to customers in the beginning of December. Regarding the company's traditional defense markets, eMagin is beginning to deliver displays for several new projects and have signed new projects that will continue into 2020. The company also announced its second design-win with a medical device company for next-gen surgical equipment (this is for eMagin's HD-plus WUXGA display). 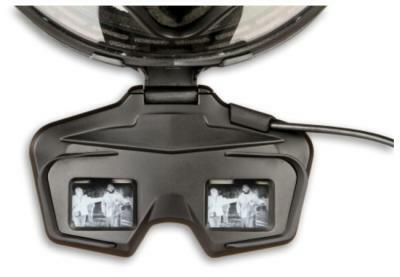 For the consumer VR market, which requires high volumes, eMagins is in advance disucssions with high-volume production partners and are also talking to Tier-One companies to embed its OLED displays in new products. eMagin also launched two new consumer sports enthusiast night-vision products. First up is the BlazeTorch - night-vision goggles system that features a SXGA (1280x1024) OLED Microdisplay, a sub-lux night-sensor, HD video&audio recording on an SD card and a built-in IR illuminator. The BlazeTorch will ship on December 30 for $999. eMagin also offers the BlazeSpark which adds night-vision capabilities to your phone (without any display, you insert the phone just like in the newly popular phone-based VR systems) and costs $299.99. 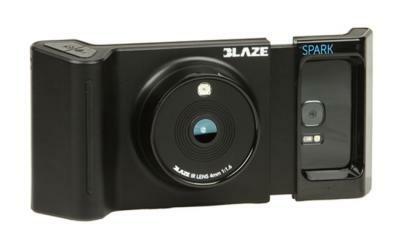 The BlazeSpark has been named a CES 2017 Innovation Awards Honoree in the Digital Imaging product.